Rooms at Casa Lanjaron B&B come with a shared or private bathroom with hairdryer and free toiletries. They all have a fan, wardrobe and most have a private furnished patio. Bed linen and towels are provided while air conditioning is available at an extra cost. A buffet breakfast is served every morning at Casa Lanjaron B&B and you can also find a selection of bars, restaurants and shops in a short walking distance. Casa Lanjaron B&B has a common lounge area with a flat-screen TV with English channels, DVD player and a large selection of books. 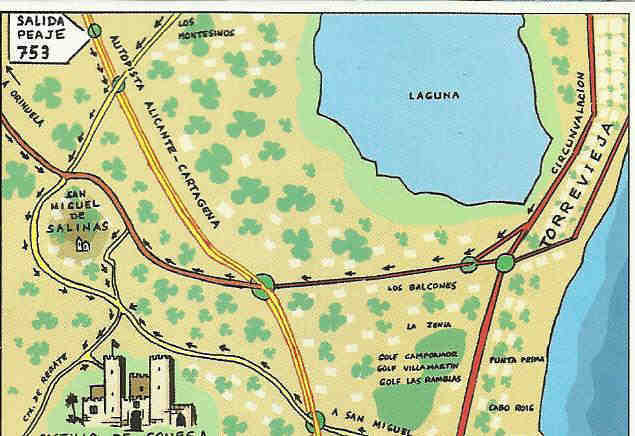 Murcia Airport is 30 minutes’ drive away and you can reach Torrevieja in 15 minutes by car. The apartment features a flat-screen TV; and there is a full-equipped kitchenette including a microwave and a fridge. The bathroom comes with a bath tub and shower; and towels and bed linen are provided. Numerous bars, restaurants as well as supermarkets are within walking distance; while La Zenia Boulevard Shopping Centre can be found within 5 minutes’ drive. Las Carolinas Apartments is 8 km from the blue flag beaches of Cabo Roig, and you can drive to Alicante Airport in 50 minutes. A free public parking is available on site. 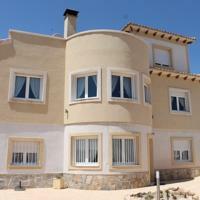 The property is 30.4 km from Murcia and free private parking is provided. The holiday home is composed of 3 bedrooms and 3 bathrooms, equipped with free toiletries. There is a seating area and a kitchen complete with a dishwasher, an oven and a microwave. A flat-screen TV is offered. Other facilities at Spain Apartments include a terrace. You can play pool at the property, and the area is popular for golfing and snorkeling. Torrevieja is 9.1 km from Spain Apartments, while Cartagena is 42.3 km away. The area is popular for windsurfing and diving. San Javier Airport is 19 km away. Featuring functional décor, the house comes with 6 bedrooms and 3 bathrooms with a shower. The living room includes a TV and sofa and there are 3 kitchens with a microwave, kitchenware and a fridge. Discounted green fees can be organised for guests at nearby golf courses, as well as booking tee times and providing transport from Casa Kimmi to the golf course. Villamartín Golf Club is 2.7 km from Casa Kimmi and a 45-minute drive will take you to Alicante-Elche Airport. There is free parking on site. SAN MIGUEL de Salinas is a small town nestled between the Orihuela Costa, above the salt lakes of Torrevieja with far reaching, stunning views over the countryside, stretching beyond to the beautiful Mediterranean. NOT MUCH is officially known about the history of San Miguel de Salinas, although it is widely believed that the first building documented was of hermitage construction in 800AD, later to be converted into a convent and monastery. In the 1600s the original parish church was built and dedicated to Saint Michael, or San Miguel. This was later rebuilt between 1689 and 1719. In 1829, the town, like many others around that area, suffered an earthquake which destroyed large parts of the area. Moving forward into modern times, the town became an independent municipality in 1955. Since then San Miguel de Salinas has developed into a thriving community with a large street market held every Wednesday morning. The popularity of the town has gone from strength to strength with many holiday makers and many people setting up home full time. The Blue Flag beaches of the Orihuela Costa are less than a 10 minute drive away, and with a great selection of locally-based restaurants, bars and shops it is easy to see why people choose this great location. There are excellent championship golf courses nearby including the famous Villamartin course (The Mediterranean Open has been held here) - all within easy reach. Thanks to excellent links to the AP7 it is very easy to discover, so whether shopping, sightseeing or looking for a good night out, San Miguel de Salinas has it all on offer. 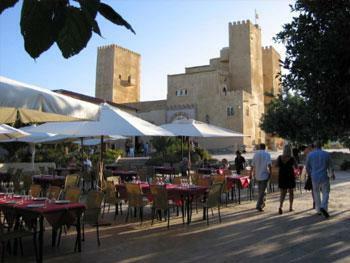 Castle Restaurant San Miguel de las Salinas Orihuela Costa Spain. The converted castle in SAN MIGUEL de Salinas Spain, that has been made into a restaurant.